How to keep dish rags from smelling is today’s reader question, this time from Lynne. Although she’s great about rinsing them after use, and hanging them over the divider in the middle of her sink, they still reek by the end of the day. As far as laundering them, she’s got a bit of an added problem there. Since finding your blog, I have become a better housekeeper in the sense that I have gone from doing nothing to at least doing something each day. Laundry isn’t one of those things, though. We don’t own a washer and dryer, so things pile up all week (sometimes up to two weeks) before one of us has time to get to the laundromat. That’s the basis of my problem: how do you keep dish rags from smelling NASTY by laundry day? Sometimes no amount of washing gets rid of that horrible smell, and I never feel like they’re getting anything clean. How do I fix this? I think we’ve all been there with smelly dish rags, washcloths, and even towels we’ve left sitting in a wet pile. Unfortunately, as you’ve discovered, once that stink gets in there it’s hard to get out. 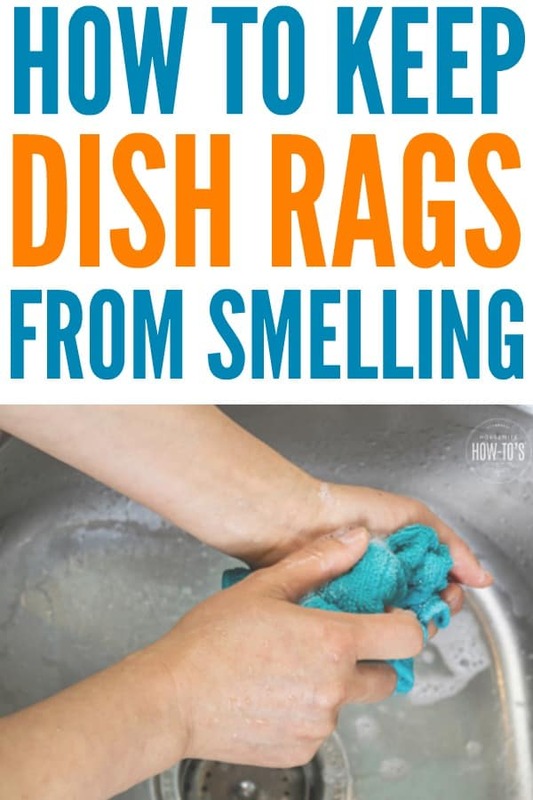 Here are some simple steps you can take to keep dish rags from smelling — and this works on cleaning cloths, too. That sour smell isn’t just unpleasant — it’s the aroma of bacteria breeding. Between food particles, grease, stuff rubbed off of your hands while using it, and moisture, there’s plenty of food to help bacteria grow. To make matters even more disgusting, that bacteria will get transferred to any surface you wipe with a smelly dishrag: your counters, sink, appliances, even your hands. From there, it’s a short step to food contamination. So, yep, you need to do something about it. Change dish rags at least once a day. Thicker dishrags hold onto more residue and take longer to dry. So, opt for thin, lightweight dish rags like these microfiber cloths with a waffle weave which air-dry much faster than standard cloth rags. Wash them in hot, soapy water immediately after use and then give them a thorough rinse. Wring the cloth well then hang it where it can air dry. The edge of the sink isn’t right for this, but the door of the oven might be. Neither are options in my house, so I stuck a suction towel bar on the tile backsplash next to my sink to hang my dishrag. Even with a thorough washing and air-drying between uses, you should still change your dishrag daily. Homeowners are typically advised to set their water heaters at 120°F, the same temperature laundromats use, too. While this conserves energy and prevents scalding injuries, it’s not hot enough to kill mildew or many forms of bacteria that cause odors. So, the first step is to boil your dishcloths to get the buildup out of there. Then, follow the proper laundering instructions below to keep the smells out. 1. Fill a large pot with 1 gallon of water and set it over HIGH heat on the stove. Bring to a boil. 2. Add 1 cup white vinegar and your dish rags to the water. 3. Boil the cloths for 15 minutes to kill odors and bacteria, mold and mildew. Turn the heat off and let the dishcloths and liquid cool to room temperature. Once cooled, wring the rags with your hands one at a time before hanging them to dry in a sunny spot. Proper laundering will kill odors and help your dishrags remain fresh-smelling. 1. Wash dishcloths and dish towels in a separate load by themselves to avoid cross-contamination. 2. Set both the wash and rinse cycle for the hottest possible water temperature. Select the longest washing time. On my machine, that’s “Heavy Duty,” but check your washer’s instructions. 3. Use your regular laundry detergent, and add 1 cup of white vinegar to the rinse cycle. 4. IMMEDIATELY transfer the cloths to the dryer when the wash cycle ends. Dry on HIGH heat for 45 minutes to knock out the smell. No Washing Machine? No problem! Just because you have to use a laundromat, or can only do laundry once a week, doesn’t mean you’ve got to put up with smelly dishrags stinking up your house. Try this trick instead: stash them in a plastic bag in the freezer where the cold temps will prevent bacteria, mold, and mildew from growing. On laundry day, pop them straight out of the freezer into the machine, no defrosting required. Just be sure to label the bag clearly, so no one goes poking around hoping to find something good to eat. Like my mother before me, I use bleach. Wikipedia says “A Risk Assessment Report (RAR) conducted by the European Union on sodium hypochlorite conducted under Regulation EEC 793/93 concluded that this substance is safe for the environment in all its current, normal uses”, and it’s what we swim in in swimming pools. I put a little bleach in a glass bowl, pour in some boiling water, and put in the dish cloths. Let them sit a few minutes. I use the handle of a wooden spoon to swish them around. The water turns a bit brown – that’s the dead bacteria! Give the cloths a good rinse. Yes, you will smell the bleach, but only for a few minutes – it soon dissipates. Quick and easy! Bleach certainly works, but some people are highly sensitive to its fumes. Don’t know if anyone’s still interested in this topic, but for what it’s worth I hang my dish rag in the dishwasher in between uses. This way, it’s out of sight, it gets to air dry, and it’s right next to the sink so it’s handy every time I need to use it. I also put my dish ‘scrubbers’ (the kind that have handles you fill with dish soap & then have either a sponge or brush tip) in the silverware compartment of my dishwasher in between uses for the same reasons. Sometimes I leave the dishwasher door ajar to let air circulate. In my mind, that’s easier to look at than my yuckie dish rag & scrubbers! 🙂 I would be lost without my dishwasher, & most of the time it’s my large, built-in drying rack! One more tip on dishwashers, & I’m out of here – years ago, we hit on a method that solved the ‘Are these clean or dirty?’ mystery that has worked well for us. When the washer has been emptied, we fill the detergent dispenser with soap. As more & more dishes accumulate, & you’re tempted to ask ‘are these clean or dirty?’ one quick glance at the soap dispenser answers the question before it’s even asked! If the dispenser is closed (full) they’re dirty & have not been washed. So whoever empties the machine, fills the dispenser. Thanks for the great tips, AT! With the “clean or dirty” question, we use a flat magnet on the front of the dishwasher. I’d tried filling the detergent dispenser, but our home has a heating vent that runs right under the machine and sink – it prevents frozen pipes in the winter, but hardens the detergent into a rock if it’s in there too long. So I took one of those flat ones our bank sends every year and covered it with Washi tape, then wrote clean on one end and dirty on the other. We flip it based on the status of the dishwasher’s contents. Works so far! Most all the dish washing liquid soaps have one that’s a blue color, ie, Dawn blue, Pamolive Blue etc. Reading their labels, they have 3X to 4x times the grease cutting abilities. At the end of the day I soak rags in a small pan using hot water and enough liquid blue to feel soapy for about an hour. Then rinse well a few times to get the soap out, Hang dry. All I can say is WOW. Pleasant scent without a trace of fetid musty odors. The blue stuff is great. Hello this is my first time on your website, all the information is amazing, I am going to put a small pail on my counter top next to the mulch scraps container, and see if putting the stinky cloths in vinegar water helps. I do believe i will boil them before i wash them, just to make sure. thank you so much. Boiling them is an unnecessary step, but if you feel more comfortable, have at it. You never answered Mariette’s question: add one WHAT of vinegar? Teaspoon, gallon, or something in between? Otherwise, thanks. I will try it tomorrow. Cup. Sorry, that’s been fixed. Thought I’d done that before now. How about keeping a soaking bucket nearby? Sort of like a diaper pail….fill it with water and vinegar and drop your funky dishclothes in it at the end of every day. When it is laundry day just dump the water out and bring the entire bucket to the laundromat. I admit I haven’t tried this method, but I’ve thought about it! Just be sure that the bucket has a tight lid if you have small children or curious pets! That should work, too. It would need to be a plastic bucket, since vinegar will corrode metal, though. Great idea! great post! I do the soap rinse all the time and still find myself changing towels a few times a day. I’ve been at others homes though where the whole kitchen smelled! They didn’t seem to notice, but I did! Thanks for linking up to Tasteful Tuesdays! love it! Really appreciate you stopping by my blog! I’m trying to keep in better touch with my linkers/readers… If you already follow me, please let me know I will find your blog on Bloglovin (I’m transferring my follows there)if you don’t follow in any way, would you consider following via GFC or other method? Oh, I know what you mean about visiting homes that reek of mildewed dish rags! Ew, right? What about the green and yellow Scotch Brite sponges. How do you get the smell out of them? I was thinking of just using the vinegar on them. I don’t think vinegar is a good idea with those, Judy. It’s so acidic that I think it would corrode them, or at least make them fall apart faster. Try mixing a bowl of 1/2 cup baking soda and 1/2 cup hot water. Add 2 tbsp. salt (doesn’t matter what kind). Stir it together well then soak the sponge overnight. The baking soda will deodorize, and the salt will help loosen up gunk. Thanks for sharing a great tip, Chris! Thank you! This was excellent! I’m going to try airing mine out on the oven door, rather than the sink. makes sense! You’re welcome, Kristina! Airing on the oven door really has helped with my stinky dish rag situation. They get to dry out, and that seems to help immensely. Nice to “meet” you! Hi, Katie! These are great tips! Have you ever cconnected with Hometalk? You could get some publicity for your great household tips! Hi Marty! I hadn’t even heard of Hometalk before you mentioned it. Will go check it out. Thanks! Great subject! This is exactly the reason why I LOVE my Miele washing machine as I can set the temperature to 170°F for killing all germs and avoiding nasty odors. Sure, they are more expensive to start out with but they do save on water, energy and will keep bacteria better in check for a healthier lifestyle. Under point 4 of How To Launder Dish Rags you mention add 1…? Thanks for always sharing great and frugal tips. This is even very important for general hygiene purposes. Hugs to you and wishing you and yours the very best. Borax. Remember 20 Mule Team Borax? It’s still out there and it works wonders on getting smells out of towels of all kinds. Get a box and add a scoop to your towels, rags, or whatever else smells. I have a washer/dryer at home so it’s been a while since I’ve had to worry about dragging everything to the laundromat. I have not tried soaking my dishrags with it. I would bet if you put it in the soak water (way less than a scoop – think small with smaller amounts of water) make sure you use warm enough water to dissolve it along with whatever detergent – woolite or whatever – that would work too. Let it sit for a while, rinse and hang to dry. If you can’t find it in the stores, check Amazon, they carry it. Borax is a wonderful cleaner, isn’t it? The problem with kitchen dishcloths is that everything gets wiped with them including grease. But washing them doesn’t fully remove said grease unless the water temp is very high and even then it’s a toss up. Very hot water for the hot cycle is something you won’t get on a commerical washing machine I would think. That means finding a product that can be used to remove the grease and smell is the only thing short of discarding and buying new every so often. Otherwise you just end up washing them, but having towels that smell as soon as they get damp. Yes, Teresa, I know. That’s why I recommended vinegar since it’s an excellent de-greaser. And I’m so tired today I’m repeating you 😉 I even went to bed early last night… LOL. It’s the weather. Winter just keeps going on and on. We need sunshine, I tell ya! Truer words were never written. We still have 5 inches of snow on the ground and it’s flurrying as I type. I want to scream. Good thing I work at home… LOL. RINSE CLOTHS AFTER USING ,THEN MICROWAVE ON HIGH FOR 1MIN OR SO . DEPENDS ON WATTAGE , AIR DRY .TA DA!